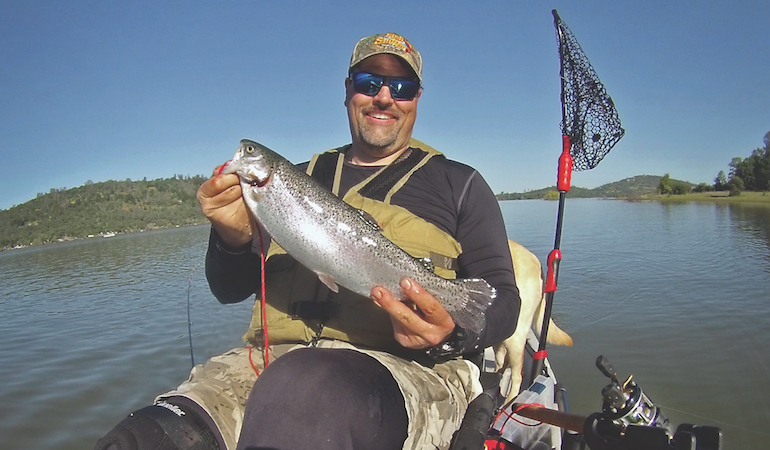 If you’re not into kayak trout fishing, you need to get started. When? Anytime you can get on the water, be it a mountain lake, small impoundment, large reservoir or even a river or tailwater fishery. While I hammer trout out of my kayak all year long, winter is my hands-down favorite time to fish. The cold months offer many advantages for the kayak-equipped trout angler. In winter the trout in reservoirs are typically near the surface and aggressively feeding on baitfish, while river trout tend to stack up in shallow runs where they get maximum warming benefit from the weak winter sun. In both situations, the trout are highly vulnerable to an angler trolling and casting from a nimble, stealthy ’yak. If you’re not up to date on what’s been going on in the kayaking scene, you might be imagining a bearded ’70s adventurer with wet, shoulder-length hair flowing from beneath a helmet sitting in a tight-around-the-waist whitewater kayak. Well, the beards are certainly back, but the fishing kayaks we have today aren’t your daddy’s whitewater kayak. Some guys are able to fish just fine from a paddle kayak, but in my view a “peddle drive” kayak is absolutely essential for serious fishing, especially if you intend to troll. Some brands utilize sophisticated fin-propulsion systems. Others use a propeller, much like the prop you see on an electric trolling motor. Yes, you can attach an electric motor to a kayak, too. Kayaks with either prop- or fin-propulsion systems have their supporters. Me? I’m a “fin guy” and amazed by the power and efficiency they offer. I can hit top speeds of 5 mph in my Hobie Pro Angler, oftentimes trolling for five or six hours without fatigue. The stability, capacity and storage incorporated into the modern fishing kayak is amazing. Truth be told, I have better immediate access to tackle, steering and speed control in my kayak than I do when I’m running a big aluminum sled. In a kayak, the rods I’m fishing are either in my hand or in rod holders within easy reach. Below those, several more rods are positioned in storage tubes ready to be called into service in seconds. Tackle, net, sonar unit? All of it surrounds my seat, is quickly accessible and is tethered, so nothing gets lost. A stove and accessories (nothing better than a hot shore lunch on a cold winter day) are often stored in the kayak’s main storage compartment. This year, one of the big events I’m looking forward to is my annual winter kayak camping trip. I’ll pick out a big reservoir and spend four or five days fishing and exploring while never setting up camp in the same cove twice. The biggest advantages for kayak-borne trout anglers come in the form of simplicity, portability and affordability. After getting my first kayak, it didn’t take me long to realize that kayaking is a lot easier and less stressful than dealing with a traditional boat. Toss your kayak in the bed of the truck with a tote holding your gear, life vest and other safety equipment, and you’re ready to roll. And while you roll, you won’t be worried about that big 20-foot hunk of aluminum following you that costs exponentially more than even the most expensive fishing kayak. I’ve run a bunch of company-sponsored, heavy-aluminum sleds and I loved every one of them because they are incredible fishing machines. What I didn’t love was the two hours of pre-trip prep time and the two hours of post-trip clean-up time. I also didn’t really like doing daily chores with a massive boat in my driveway that always seemed to be blocking the easiest line of travel. And I really didn’t love it when my transmission exploded while I was trying to back a huge 21-foot deep-hulled aluminum boat up a steep driveway. For the ultimate in simplicity you can easily carry a fishing kayak in the bed of your truck or on a roof top rack if you run a wagon or SUV. With my kayaks, most of the stuff that isn’t in the kayak already is stored in a big plastic tote. I can hit the road pretty much instantly when the opportunity arises. These days I have a modified utility trailer that allows me to carry two kayaks. And there’s never fear of finding the launch ramp in wintertime is standing yards above the waterline. A lot of Western reservoirs are drawn down in winter in preparation to receive spring run-off. This is of no consequence to the kayaker. Simply drive down to the shoreline and launch. If the shoreline is too rough, snap the wheels on your ’yak and walk it down. It’s that simple, and since that launch ramp is closed, you’ll likely have that part of the lake all to yourself. Before we fish or even step into the water to hop onto your kayak, get that life jacket on and keep it on. Dead men don’t catch trout. Enough said. My kayak is so stealthy, I spend most of my time aboard it on lakes trolling and exploring backwater areas where I’d never take a big boat. But trout aren’t always in “small” water, and other lake-fishing approaches put trout on the stringer, too. In winter, when the trout are up in the water column, I run one rod spooled with mono for “top-line” trolling, while a second outfit holds lead-core line that take my lures 25 feet deep. (In summer, I run a small crank-styled downrigger for controlled-depth trolling.) When you find a concentration of fish, plugging for them with spoons and spinners is a no brainer, and I’ve had many productive days drifting worms and live minnows beneath slip bobbers. Western trout fishing also includes rivers and tailwater fisheries. Many hold large trout that feed throughout the winter months, when fishing pressure on most rivers is exceptionally light. If you haven’t done much river fishing for trout from boats using conventional gear, you probably are envisioning the kayak drifting along as the angler “side drifts” bait or flies, much like steelhead anglers present roe while fishing from a drift boat. That method absolutely produces trout, but a much more exciting option is back-trolling lures. It works like this. Using your peddles or paddle, the kayaker keeps the craft moving downstream at a pace slower than the river is flowing. In front of the kayak the angler hangs a lure — typically, a small plug — in the current, working upstream against the flow. The lure’s action — be it wobbling, diving and/or shimmying — is imparted as the current strikes the lure, which is held against a tight line. I drop my kayak’s peddle system into reverse so all the action is out in front of me. The peddles working with the rudder allow me to “walk” my plugs into some awesome spots. In shallow water, some plugs dive deep enough that you can basically “top-line” them a set distance behind the kayak, and they will dive into the strike zone. If that isn’t an option, you can run a three-way rig and attach small sinkers that range upward from 1/2-ounce to get the lure down into the near-bottom strike zone. If you want to bring a new level of stealth, simplicity and satisfaction to your trout fishing, check out kayak fishing. Many kayak shops have “get acquainted” days, where you can jump in a variety of different kayaks and take them for a test spin. When you do get afflicted with the kayak bug, remember: Safety always comes first. Always wear your PFD (mine has a personal rescue beacon attached), and when you’re going to be out in low-light conditions, run an LED strobe light off the back of the ‘yak.